Celleporaria sibogae, showing the characteristic hollow colony structure of this bryozoan genus. Image by Bob Fenner. Lepraliellidae are a family of bryozoans (small colonial animals sometimes known as 'lace animals' or 'moss animals' due to the appearance of the colonies) found around the world with the highest diversity in warmer waters. Different species may grow as encrusting forms or as upright branching colonies and even lunulitiform varieties have been recorded from the Eocene of Australia (Schmidt & Bone, 2002). Distinction of the various types of bryozoan requires close microscopic examination of the individual zooids (the units of the colony). 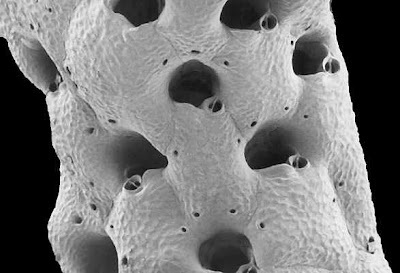 Lepraliellidae belong to one of the more successful branches of the bryozoans, the Cheilostomata, which have each individual animal in a separate calcified box-shaped chamber. Within the Cheilostomata, they belong to the Ascophora which have an entirely calcified frontal wall on each chamber. Characters used in distinguishing Lepraliellidae from other ascophorans include umbonuloid growth of the relatively smooth frontal wall (i. e. primary calcification of the wall is internal rather than external), widely open ovicells (embryo brooding chambers) and a small spine-encircled ancestrula (the first zooid of a new colony to develop from a metamorphosed larva). In most species, an avicularium is present on the lower edge of the main opening of each feeding zooid though this feature is absent in Kladapheles gammadeka (Gordon, 1993). SEM image of Buchneria dofleini colony showing individual zooids. 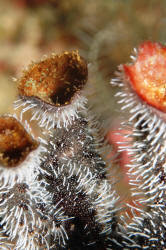 The larger openings are those of feeding zooids, with a smaller avicularium opening against each one. Image by Dennis Gordon. Lepraliellids of the genus Celleporaria include some of the largest of all bryozoan colonies, with individual heads up to a foot in height and nearly a metre in diameter, that may form predominantly bryozoan reefs (Hageman et al., 2003). Branches of upright Celleporaria colonies have a characteristic nodular appearance and are generally thick but hollow as they originally grow around an organic substrate such as a sponge that later dies off after being overgrown. Some species of Celleporaria are significant fouling agents on the bottoms of boats, and have been spread around the world by shipping. Gordon, D. P. 1993. Bryozoan frontal shields: studies on umbonulomorphs and impacts on classification. Zoologica Scripta 22 (2): 203-221. Hageman, S. J., J. Lukasik, B. McGowran & Y. Bone. 2003. Paleoenvironmental significance of Celleporaria (Bryozoa) from modern and Tertiary cool-water carbonates of southern Australia. Palaios 18 (6): 510-527. Schmidt, R., & Y. Bone. 2002. Eocene bryozoan assemblages of the St Vincent Basin, South Australia. In Bryozoan Studies 2001 (P. N. Wyse Jackson, C. J. Buttler & M. E. Spencer Jones, eds) pp. 293-298. A. A. Balkema. I visited your website http://catalogue-of-organisms.blogspot.com/, the information which you have shared in your site is very much standard and presentation of pages is very legible. The Information present in your site is very informative and, it gives a wide knowledge about many things. I was very much impressed with your site. Its guide me more. If you give my links on your site it will be useful to share our ideas and information to this world. Description: Our site has complete resource structure of dinosaur exposing a rich cache, right from abelisaurus to, even more complete skeletons of dinosaurs which have become a part of world culture, and have remained consistently popular, especially among children. If you have any questions please feel free to email me and I will respond promptly. Waiting for your E-Mail let me know once you added my link.